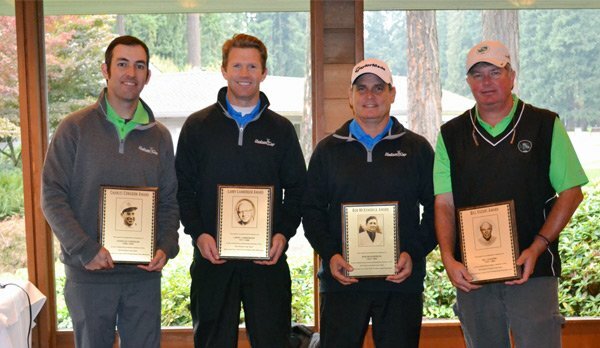 The 66th edition of the Hudson Cup Matches concluded Tualatin CC in Tualatin, OR. The professional and amateur team tied at 10 points each in the 66th Hudson Cup Matches. In the 23rd edition of the Senior Hudson Cup, the amateurs beat the professionals for the first time since 2003 with a two day point total of 12 1/2 to 7 1/2. The Charles Congdon Award went to Sean Packer and the Larry Lamberger Award was presented to Tim Feenstra. In the Senior Matches, The Bill Eggers Award was presented to Alex Stamey while Joe Carranza was bestowed the Bob McKendrick Award. The Hudson Cup Matches were created in honor of Robert Hudson of Portland Golf Club in 1949. This event will pair the top 10 PNW PGA Members against the top 10 PNW amateurs for the 66th Hudson Cup Matches while the top 10 PNW PGA Senior Members will compete against the top 10 Senior PNW amateurs for the 23rd Senior Hudson Cup Matches at Tualatin CC on October 23-24. Robert A. Hudson was a very successful Portland businessman whose firm, Hudson House, was one of the nation’s leading wholesale grocers. Hudson played golf at Portland Golf Club and was devoted to the game. During World War II, the PGA of America was trying to keep its Tour alive and was in dire need of sponsors. Hudson stepped up to the plate with the urging of Larry Lamberger, Portland Golf Club head professional, and offered to underwrite a 72-hole open tournament with a purse of $10,000. Thus the 1944 Portland Open was born, and Sam Snead won it. Hudson stayed with the program and went on to sponsor the 1945 Portland Open (in which Ben Hogan set the 72-par 72-hole scoring record of 27-under-par 261) and the 1946 PGA Championship, won by Hogan. Hudson went on to sponsor Portland Opens in 1948 and 1949 and the Western Open in 1955, all at Portland Golf Club, and he became the first chairman of the PGA Advisory Committee. Each player plays three matches: a Foursome match, Four-Ball Match, and a Singles Match. At the completion of the matches, awards are presented to the outstanding player on each team as decided by votes of the members of the opposite team. They honor Chuck Congdon, Larry Lamberger, Bob McKendrick and Bill Eggers, four great players with outstanding Hudson Cup records. The Professionals have won 55 of the 66 matches against the amateurs, losing only 6 and tying 5 matches. While the Professionals have been dominating the Hudson Cup Matches in recent years, the Senior Professionals have also been winning the Senior Hudson Cup Matches. The Senior Professionals have won 21 of 23 Matches in the 23 year history. CLICK HERE to view 66th Hudson Cup Matches and 23rd Senior Hudson Cup Matches results.